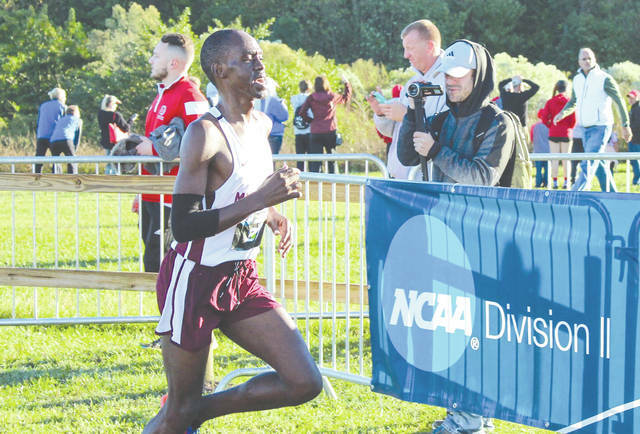 LAKELAND, Fla. – Central State University’s Raymond Korir finished in second place at the NCAA Division II South Region Cross Country Championships, at Holloway Park. Korir crossed the finish line with a time of 31 minutes, 44.18 seconds, becoming the first CSU runner to automatically qualify for the NCAA Division II National Championships. Junior Emmanuel Birgen, finished in 35th place with a time of 33:18.98. Birgen’s time was not quick enough to enable him to join Korir at nationals, however. The full Division II qualifying list was released by the NCAA on Nov. 19. The Cedarville University men’s team also qualified for the D-II national championship meet. This year’s championship race will be held on Saturday, Dec. 1 at Schenley Park in Pittsburgh. Korir, a freshman from Kenya, has been CSU’s top runner throughout the fall. He finished first at the Southern Intercollegiate Athletic Conference Championships earlier this month at Winthrop University in Rock Hill, S.C., earning SIAC Runner of the Year honors. He has also been selected as the SIAC Runner of the Week twice this season. https://www.fairborndailyherald.com/wp-content/uploads/sites/50/2018/11/web1_CSUKorirCC_PS.jpgPhoto courtesy of Central State University. For more information on Central State University athletics, please visit their website at maraudersports.com.